Santa Barbara Sheriff’s deputies arrested Randy and Evi Quaid for squatting at a home they used to own in Montecito on the 1300 block of East Mountain Drive on Saturday, according to the sheriff’s department. A representative of the property owner called the sheriff’s department to report that someone was living in a guest house on the property. When deputies arrived, the Quaids insisted they had owned the property since the 1990s. However, the representative was able to provide documentation that showed the Quaids had sold the property about five years earlier. Randy Quaid was handcuffed without incident, but deputies were forced to restrain Evi Quaid who physically resisted arrest. 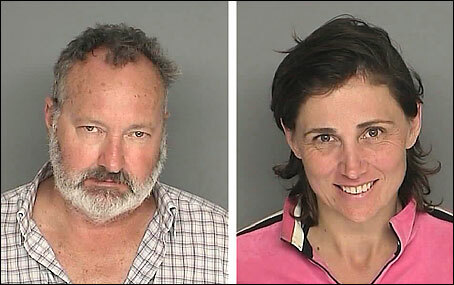 Deputies booked Evi and Randy Quaid into Santa Barbara County Jail for entering a building without consent, a misdemeanor. Evi Quaid was also booked for misdemeanor resisting arrest. Bail is set at $50,000 each. In September 2009, the couple was arrested for allegedly failing to pay a $10,000 bill for a hotel stay in Santa Barbara County. Charges against Randy Quaid were dropped. Evi Quaid pleaded no contest to a misdemeanor and was sentenced to three years probation and ordered to perform 240 hours of community service. Randy Quaid? The Randy Quaid? Vacation’s “Where’s the Dam bathroom?” Randy Quaid? looks like they bailed out, so who’se to know who’se damn bathroom they will be using next. O.k. this is the second time with the Quaids and Santa Barabara. What the hell??? Did they shorten Their name from Quaalude’s? Because in the last few years I swear I think that is what they are on!! LOL – He was arrested without incident and he sure doesn’t look very happy, unlike Evi who appears to have had a good time! They sure are a pair. It’s difficult to have sympathy for them when they do things like rack $10K hotel bills, living it up! I was wondering why they have such a high bail, then I remembered when they blew off all their court appearances for the Santa Barbara Hotel bill. They got locked up with a 100K bail that time. Whimsical photo of them at a premier in Hollywood.